Tomorrow, Mesdames et Messieurs, is the day when we will be training Louis Catorze to use Le Tunnel. Until now we’ve kept it hidden from view by leaning a big floor tile against it, because we didn’t want him to attempt to use it whilst locked and then be discouraged from ever trying again. So we decided that we would unveil it to him when he’s allowed to use it, on a weekend day when we will be around to fix any mishaps or release the silly sod if he gets trapped. The problem last time was that Louis Catorze didn’t understand that he had to push the door with his head (maybe because, as a mighty monarch who commands a nation, he is used to having lowly peasants open doors for him). For those who aren’t familiar with the workings of a Sureflap chatière, kitty needs to push with his head to allow the reader to read his microchip; contrary to non-Sureflap-owners’ belief, the chatière doesn’t open from a distance, not even a short one. So Louis Catorze’s failure to push meant he didn’t get out. Then one day, after around 5 months of us trying everything we could think of including spraying the door with catnip (made no difference), and sticking opaque paper over it just in case it was the transparency that freaked him out (also made no difference), he just went out. Once only, mind, but still! A few weeks later he’d cracked it. So it really could go either way tomorrow: un grand succès or un désastre total. I can’t help but have high hopes for my dear boy despite the fact that, in order for the Sureflap to initially register him as a user, Cat Daddy had to stuff him undignifiedly through it as one would stuff a duvet cover into the washing machine. Next > Le jour de gloire est arrivé! Perhaps a box to act as a step until he gets used to it? I like your last sentence….and it made me think that Le roi would surely follow a feather duvet down the tunnel! But joking apart, we had a similar problem with our catflap (magnetic in those days). The fact that the magnet which was hanging from Minouche’s collar had to be high enough to open the gates! So we had to build a step outside the back door to enable this. It worked a treat. So a permanent step to raise His Majesty maybe?? Catflap in my kitchen on a Saturday morning. 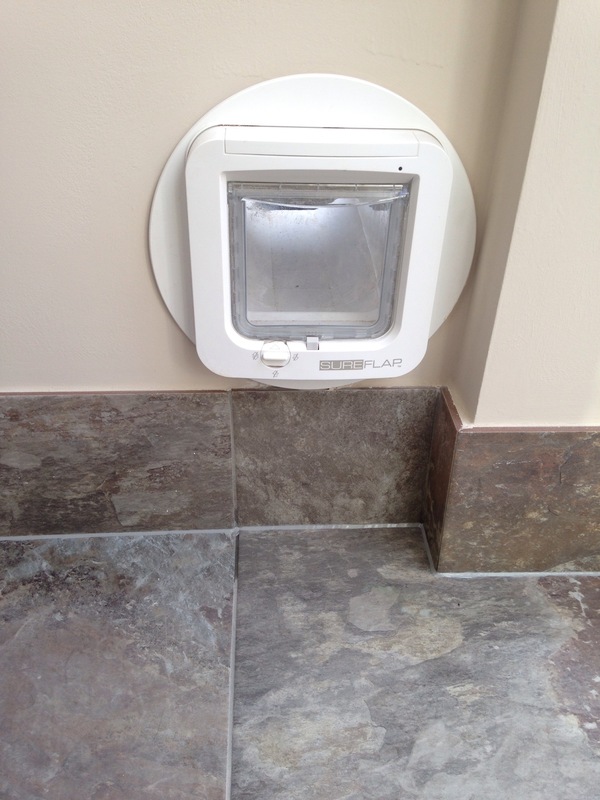 When we had a carpenter do some work for us recently, he made a step for the cat flap and it made all the difference! Good luck in your mission….